Coda is possibly one of Toronto's main destinations for quality house and techno music and as it celebrates its second anniversary, it opens its doors to a popular producer within today's underground music scene. 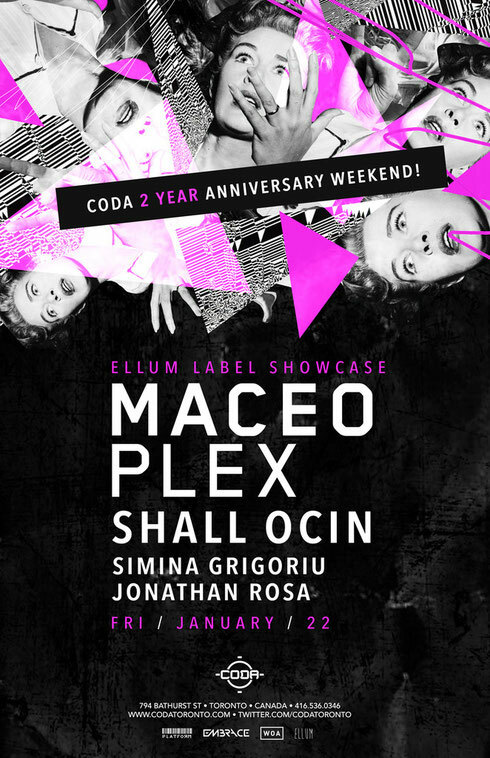 Ellum label boss, Maceo Plex, will take over the decks for what aims to be a night of top music and celebration. Joining Maceo will be support from local DJs, Simina Grigoriu and Jonathan Rosa. It's only two years ago since Coda officially opened their doors, apparently welcoming an ever-growing community of dance music enthusiasts. What was once Footwork, a small, intimate venue that housed both international and local DJ/producers for nearly a decade, eventually relocated and expanded their walls, re-emerging as Coda. Today, the Footwork legacy lives on stronger than ever and looks forward to celebrating two years alongside Maceo Plex on Friday, 22 January.